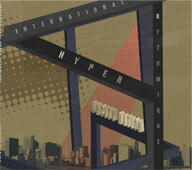 International Hyper Rhythmique is the band of Laurence, Jean, and Claire Marital-Guilhem, three siblings from Toulouse, France. Their band, which i will refer to as IHR, makes a pleasant and complex pop music. Laurence (apparently that is a female name in France -- who knew?) sings in a clear yet modest fashion and plays bass. Brother Jean plays guitar, and sister Claire adds keyboards and drumming. It is a simple formula, one that transcends national boundaries. Laurence sings in English, which makes me think they are targeting their music, at least somewhat, towards my countrymen. The music is recorded clearly, meaning that each instrument stands on its own with a minimum of distortion. The recording and the general sparseness of their sound is similar to a lot of contemporary European music (see also: Lali Puna, Guernica, etc.). The overall effect is to make the songwriting stand out. The siblings Marital-Guilhem do a good job of crafting catchy tunes. The album starts out with Monday 7.24, in which synths whoosh and flow against a deep, slow bass riff and some arpeggioed guitar while Laurence sings lightly. It is a mellow, pleasant start to the record. Carry Out starts off Tortoise-like with a cascade of marimba and some crunchy guitar. Laurence's voice here sounds more French than on the previous tune, a strange fluke of her pronunciation. It is a good tune, and in particular, i like the contrast between the rhythms, the keyboardy drone, and the slowly grinding guitar. Les Yeux de Juin also features heavily accented vocals, here in a sparser framework than the previous tune. The drums here are a low tapping, and the guitar plucks notes that echo against Laurence's smoky voice. Folka features the band channeling Violet Indiana. Jean plays his guitar with lots of echo and tremolo, while the bass thunks lightly and Laurence sings with less of an accent. There is a horn that comes in on the chorus, where Claire plays a slight piano riff, all of which adds a lovely jazzy feel to this tune. Nicely done. But IHR are not all about living in the past. Monday Morning features an electro sounding beat and burbling synths. This is not rave music, but instead is closer to what Massive Attack do. The song builds slowly, and Jean's guitarwork reminds me of The For Carnation. The computer generated beats and the sparse post-rock guitar blend together very well. The song fades into City Nation, which is a three minute interlude of piano and crowd samples. La Plus PetiteTempête de Neige starts with a seesawing electro drone, before the band kicks in with chugging guitars and Claire really beating the drum kit. That French girl can really drum! This is a pretty frantic tune, moving along at a breakneck pace. It fades slowly, with a nervous syncopated keyboard bit. After a moment of silence, the bass starts riffing as Six AM starts. Laurence's vocals here remind me of Mary Timony -- that sort of lethargic delivery half-buried in the mix that was common in mid-era Helium. The guitar is really going crazy here, and there is an odd keyboard part droning in the background. And then, suddenly, gloriously, after the bridge, IHR give their listeners a perfect pop moment, with Claire singing "Allo, Allo, Allo" in the background while Jean channels The Housemartins. Wow. Grand Whiskey begins with echoed guitar before a funky bass riff comes in. Jean sings along with Laurence here, his male voice whining along her fainter voice. The guitar moves under a wah-wah pedal, and i am left wondering exactly how popular is George Clinton in France? This is no Atomic Dog, but it is significantly more funky that i would expect from people who come from a culture that respects Jerry Lewis. Fucked Up leaves the funk behind, and shows IHR sounding like Bettie Serveert. Laurence really sounds like Carol van Dyk here, and the keyboards do a sort of spacey thing, while the drums are thunderously loud and the guitar grinds away. Another stunner. Finally, the record ends with My Love, a poppier song than the few that have preceded it. It is a happy little mid-paced tune, on which Jean's guitar really shines. A good end to the record. Uncity Nation really work as an album, and the siblings Marital-Guilhem have proven themselves to be capable of producing some very enjoyable pop music. One thing of note is the release of this record, and how EvilSponge came to hear it. The album was released on the internet in June of 2009. A year later, physical copies were made, and in order to drum up publicity EvilSponge was emailed a download. Which means that in order to promote the physical copy of a record that had obviously already proved successful as a digital edition, the record label gave out copies of that digital edition. This seems kind of backwards to me, but whatever. It's a good record, and i look forward to more from this act.